Partisan warriors wearing fur caps; log forts; epic battles: The 18th Century American frontier, right? Nope. Try the 17th Century Polish frontier. The Wild East is terra incognita to most folks in the West. For my generation, it was a land beyond an Iron Curtain — it’s entire history obscured by the fog of the Cold War. Yet Eastern Europe has a fascinating frontier history; indeed, for centuries it was the most significant frontier in the world — that between the West and the Ottoman Empire. Many a fine frontier tale can be found in those steppes and forests and one of the finest is “With Fire And Sword (Ogniem i Mieczem),” a historical novel by Henryk Sienkiewicz published in 1884. Sienkiewicz is best-known in the West for his Nobel Prize-winning “Quo Vadis,” but his trilogy of novels about Poland’s tumultuous 17th Century is considered a national epic. 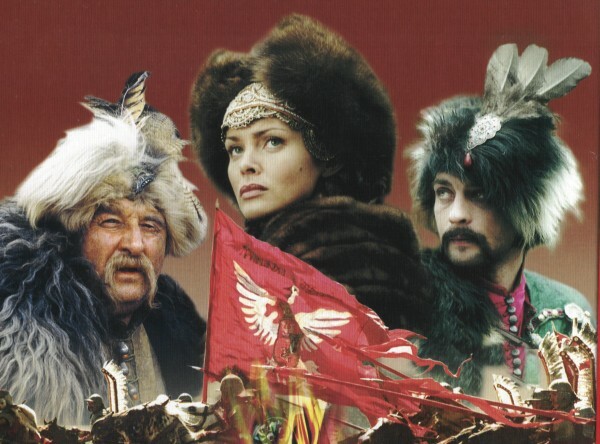 This Polish epic recounts the great Ukrainian Cossack uprising of 1648. In 1999 it was made into a movie directed by Jerzy Hoffman. It was, when released, the most expensive Polish film ever made. All that money is up on the screen, in spectacular battle scenes and sweeping panoramas of a gorgeous country. The movie is a rousing good time — an old-fashioned swashbuckler filled with knights of touchy honor, undying love at first sight, triumph, tragedy and dollops of broad, sometimes slapstick humor. We in the West are accustomed to thinking of Poland as a historical victim, a flat, difficult-to-defend country repeatedly carved up by aggressive, militaristic neighbors. Brave but doomed. But at the time of our tale, the Polish-Lithuanian Commonwealth was the largest and most powerful political entity in Central Europe. Its aristocracy was a fighting cadre of proud and hardy noblemen, accustomed to rough log forts and lodges, bred to the hunt and to war. Their Winged Hussars were the most spectacular and fearsome cavalry formation in Europe. For more than a century, the Poles were standard-bearers in the perpetual battle against the expansionist Ottoman Empire. With Fire and Sword captures all the pageantry and the rough majesty of life on the Polish frontiers and also offers up the barbaric splendor of the Cossacks. Fans of Harold Lamb’s Khlit the Cossack stories will rejoice in seeing the Zaporizhian Sich brought vividly to life. 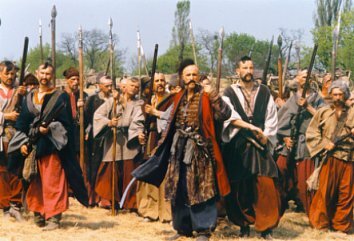 The Cossack Rebellion was led by Bohdan Khmelnytsky, portrayed brilliantly by the redoubtable Bogdan Stupka, who reappeared in 2009’s Taras Bulba. He’s the highlight of the movie, also populated by Michal Zebrowski, who made a vivid turn as the villain in the Russian film 1612, and former Bond girl Izabella Scorupco. The battle scenes are spectacular and the violence of the age is not sanitized. Be warned: watching “With Fire and Sword” may spark a fierce interest in Polish-Ukrainian military history. “With Fire And Sword (Ogniem i Mieczem),” is widely available with English subtitles. Oh mate, you gotta love it! I’ve seen clips of “With Fire and Sword” on Youtube and I wondered who were all these Cossacks fighting on foot? I’d always thought the Cossacks were people who would rather die than walk. Apparently, this was not always the case. I’m not an expert on 17th Century Warfare, but my understanding is that, as light cavalry, the Cossacks were no match in head-to-head combat with the heavy shock of the Polish-Lithuanian Winged Hussars. They adopted and adapted the mobile fortress of war wagons used in Central Europe as a counter measure to the Winged Hussars. That tracks with the use of the Cossacks to harry Napoleon’s retreat in the 19th Century. Excellent light cav, not suitable as shock troops. BTW, are you getting snowed in again?